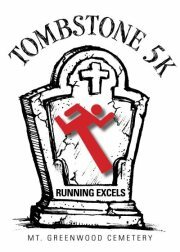 The Tombstone 5K includes a 5K Run/Walk through the historic cemetery of Mount Greenwood. We expect to have up to 500 participants. Incorporated with the run, a collection of family events will be offered afterwards. Participants are encouraged to run in costume and prizes will be awarded. A portion of the proceeds from this event will benefit The Maeve McNicholas Memorial Foundation and Team Nate. Beverly Bodyworks Inc. is proud to be one of the sponsors for this event. Goody Bag will include a hooded sweatshirt. Note: Beverly Bodyworks Inc. will be closed on Saturday, October 20th. Please join us at the Tombstone 5K in lieu of class that morning.